Twydil Hemopar Equine Supplement successfully stimulates a healthy appetite in horses, helping to support healthy liver function. This product is great for horses suffering from lack of appetite or bad digestion due to stress, competition or otherwise. 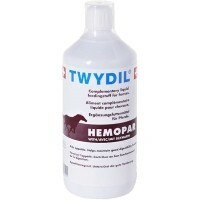 Twydil Hemopar Equine Supplement encourages a healthy digestive system and helps to prevent ulcers. 60 ml per day (3 bottle cups) mixed with the daily feed. Extract of artichoke and the chelated choline citrate complexes of iron, cobalt, copper, manganese and zinc, vitamin B1, B2, B6, nicotinic acid, pantothenic acid.